To establish a connection to the internet, some Internet Service Providers (ISPs) require Virtual LAN (VLAN) to be enabled on your Linksys Smart Wi-Fi Router's WAN connection. VLAN settings configure the router to work with IPTV, VoIP and other services that may be provided by your ISP. Follow the steps below to learn how to do this. NOTE: This feature may not be supported in some Linksys Smart Wi-Fi Routers. Access your Linksys Smart Wi-Fi Router’s web-based setup page. To learn more, click here. On the left navigation pane, click the Connectivity Tool under Router Settings. Toggle the VLAN button to ON. 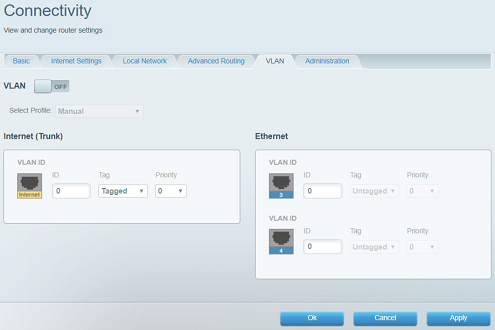 Select Profile Select a pre-configured profile for your ISP's required VLAN settings. If your ISP is not on the list, select Manual and enter the VLAN information provided by your ISP. Ethernet Some ISP profiles dedicate Port 3 for Voice and Port 4 for Video. If this is needed, a VoIP device needs to be connected directly to Port 3 and a Video device (such as an IPTV) needs to be connected to Port 4. The other ports (1 and 2) are treated as Data traffic and devices will still get online but treated as Data traffic. In the list, there are several pre-set ISP configuration files. Select the profile for your ISP. NOTE: In this example, M1 (Fibre) is used. 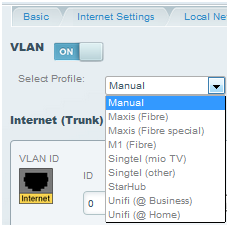 If your ISP is not listed, select Manual. 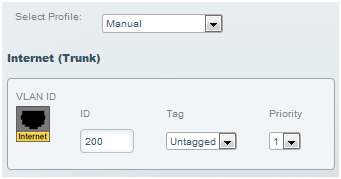 Enter the VLAN ID supplied by your ISP in the ID box then select the appropriate Tag and Priority. You have now successfully configured the VLAN of your Linksys Smart Wi-Fi Router.